A geometric object is an object that provides a parametrised description of its shape via the function GeomObject::position(...). The minimum functionality is: The geometric object has a number of Lagrangian (intrinsic) coordinates that parametrise the (Eulerian) position vector, whose dimension might differ from the number of Lagrangian (intrinsic) coordinates (e.g. for shell-like objects). The shape of a geometric object is usually determined by a number of parameters whose value might have to be determined as part of the overall solution (e.g. for geometric objects that represent elastic walls). The geometric object therefore has a vector of (pointers to) geometric Data, which can be free/pinned and have a time history, etc. This makes it possible to `upgrade' GeomObjects to GeneralisedElements – in this case the geometric Data plays the role of internal Data in the GeneralisedElement. Conversely, FiniteElements, in which a geometry (spatial coordinate) has been defined, inherit from GeomObjects, which is particularly useful in FSI computations: Meshing of moving domains is typically performed by representing the domain as an object of type Domain and, by default, Domain boundaries are represented by GeomObjects. In FSI computations, the boundary of the fluid domain is represented by a number of solid mechanics elements. These elements are, in fact, GeomObjects via inheritance so that the we can use the standard interfaces of the GeomObject class for mesh generation. An example is the class FSIHermiteBeamElement which is derived from the class HermiteBeamElement (a `normal' beam element) and the GeomObject class. The shape of a geometric object can have an explicit time-dependence, for instance in cases where a domain boundary is performing prescribed motions. We provide access to the `global' time by giving the object a pointer to a timestepping scheme. [Note that, within the overall FE code, time is only ever evaluated at discrete instants (which are accessible via the timestepper), never in continuous form]. The timestepper is also needed to evaluate time-derivatives if the geometric Data carries a time history. Definition at line 105 of file geom_objects.h. Definition at line 111 of file geom_objects.h. Definition at line 116 of file geom_objects.h. Constructor: pass # of Eulerian and Lagrangian coordinates. No time history available/needed. Definition at line 123 of file geom_objects.h. Constructor: pass # of Eulerian and Lagrangian coordinates and pointer to time-stepper which is used to handle the position at previous timesteps and allows the evaluation of veloc/acceleration etc. in cases where the GeomData varies with time. Definition at line 146 of file geom_objects.h. Definition at line 167 of file geom_objects.h. Definition at line 179 of file geom_objects.h. 2nd derivative of position Vector w.r.t. to coordinates: = ddrdzeta(alpha,beta,i). Evaluated at current time. Reimplemented in oomph::EllipticalTube, oomph::Ellipse, and oomph::StraightLine. Definition at line 313 of file geom_objects.h. Referenced by oomph::CircularCylindricalShellMesh< ELEMENT >::assign_undeformed_positions(), oomph::KirchhoffLoveBeamEquations::fill_in_contribution_to_residuals_beam(), oomph::KirchhoffLoveShellEquations::fill_in_contribution_to_residuals_shell(), oomph::KirchhoffLoveShellEquations::get_energy(), oomph::KirchhoffLoveBeamEquations::get_energy(), and oomph::KirchhoffLoveShellEquations::get_strain_and_bend(). Posn Vector and its 1st & 2nd derivatives w.r.t. to coordinates: = drdzeta(alpha,i). = ddrdzeta(alpha,beta,i). Evaluated at current time. Definition at line 329 of file geom_objects.h. Derivative of position Vector w.r.t. to coordinates: = drdzeta(alpha,i). Evaluated at current time. Reimplemented in oomph::Ellipse, oomph::StraightLine, and oomph::MeshAsGeomObject. Definition at line 299 of file geom_objects.h. j-th time-derivative on object at current time: . Reimplemented in oomph::FiniteElement, oomph::FSIAxisymFoepplvonKarmanElement< NNODE_1D, FLUID_ELEMENT >, oomph::PseudoBucklingRing, and oomph::ImmersedRigidBodyElement. Definition at line 271 of file geom_objects.h. Return pointer to the j-th Data item that the object's shape depends on. This is implemented as a broken virtual function. You must overload this for GeomObjects that contain geometric Data, i.e. GeomObjects whose shape depends on Data that may contain unknowns in the overall Problem. Reimplemented in oomph::SolidFiniteElement, oomph::FiniteElement, oomph::Circle, oomph::RefineableSolidElement, oomph::Ellipse, oomph::StraightLine, oomph::FSIAxisymFoepplvonKarmanElement< NNODE_1D, FLUID_ELEMENT >, oomph::PseudoBucklingRing, oomph::MeshAsGeomObject, oomph::ImmersedRigidBodyElement, and oomph::FaceElementAsGeomObject< ELEMENT >. Definition at line 230 of file geom_objects.h. Referenced by oomph::ElementWithMovingNodes::assemble_set_of_all_geometric_data(), and oomph::ImposeDisplacementByLagrangeMultiplierElement< ELEMENT >::set_boundary_shape_geom_object_pt(). A geometric object may be composed of many sub-objects each with their own local coordinate. This function returns the "global" intrinsic coordinate zeta (within the compound object), at a given local coordinate s (i.e. the intrinsic coordinate of the sub-GeomObject. In simple (non-compound) GeomObjects, the local intrinsic coordinate is the global intrinsic coordinate and so the function merely returns s. To make it less likely that the default implementation is called in error (because it is not overloaded in a derived GeomObject where the default is not appropriate, we do at least check that s and zeta have the same size if called in PARANOID mode. Definition at line 374 of file geom_objects.h. A geometric object may be composed of may sub-objects (e.g. a finite-element representation of a boundary). In order to implement sparse update functions, it is necessary to know the sub-object and local coordinate within that sub-object at a given intrinsic coordinate, zeta. Note that only one sub-object can "cover" any given intrinsic position. If the position is at an "interface" between sub-objects, either one can be returned. The default implementation merely returns, the pointer to the "entire" GeomObject and the coordinate, zeta The optional boolean flag only applies if a Newton method is used to find the value of zeta, and if true the value of the coordinate s is used as the initial guess for the method. If the flag is false (the default) a value of s=0 is used as the initial guess. Reimplemented in oomph::FiniteElement, oomph::FSIHermiteBeamElement, and oomph::MeshAsGeomObject. Definition at line 352 of file geom_objects.h. Referenced by oomph::BrethertonSpineMesh< ELEMENT, INTERFACE_ELEMENT >::BrethertonSpineMesh(), oomph::ImposeDisplacementByLagrangeMultiplierElement< ELEMENT >::set_boundary_shape_geom_object_pt(), oomph::RefineableAlgebraicFSIDrivenCavityMesh< ELEMENT >::update_node_update(), oomph::RefineableAlgebraicCylinderWithFlagMesh< ELEMENT >::update_node_update(), oomph::AlgebraicFishMesh< ELEMENT >::update_node_update(), oomph::RefineableAlgebraicChannelWithLeafletMesh< ELEMENT >::update_node_update(), and oomph::RefineableAlgebraicCollapsibleChannelMesh< ELEMENT >::update_node_update(). Access function to # of Eulerian coordinates. Definition at line 185 of file geom_objects.h. Referenced by oomph::FSIHermiteBeamElement::dposition_dlagrangian_at_local_coordinate(), oomph::FSIDiagHermiteShellElement::dposition_dlagrangian_at_local_coordinate(), oomph::NavierStokesSurfacePowerElement< ELEMENT >::drag_force(), oomph::KirchhoffLoveBeamEquations::fill_in_contribution_to_residuals_beam(), oomph::NavierStokesSurfaceDragTorqueElement< ELEMENT >::get_drag_and_torque(), oomph::KirchhoffLoveShellEquations::get_energy(), oomph::KirchhoffLoveBeamEquations::get_energy(), oomph::NavierStokesSurfacePowerElement< ELEMENT >::get_kinetic_energy_flux(), oomph::KirchhoffLoveBeamEquations::get_non_unit_tangent(), oomph::KirchhoffLoveBeamEquations::get_normal(), oomph::NavierStokesSurfacePowerElement< ELEMENT >::get_rate_of_traction_work(), oomph::NavierStokesSurfacePowerElement< ELEMENT >::get_rate_of_traction_work_components(), oomph::NavierStokesSurfacePowerElement< ELEMENT >::get_volume_flux(), oomph::AlgebraicRefineableQuarterTubeMesh< ELEMENT >::node_update_central_region(), oomph::AlgebraicFishMesh< ELEMENT >::node_update_in_body(), oomph::AlgebraicRefineableQuarterCircleSectorMesh< ELEMENT >::node_update_in_central_box(), oomph::AlgebraicFishMesh< ELEMENT >::node_update_in_fin(), oomph::AlgebraicRefineableQuarterCircleSectorMesh< ELEMENT >::node_update_in_lower_right_box(), oomph::AlgebraicRefineableQuarterCircleSectorMesh< ELEMENT >::node_update_in_upper_left_box(), oomph::AlgebraicRefineableQuarterTubeMesh< ELEMENT >::node_update_lower_right_region(), oomph::AlgebraicRefineableQuarterTubeMesh< ELEMENT >::node_update_upper_left_region(), oomph::PMLTimeHarmonicLinearElasticityTractionElement< ELEMENT >::output(), oomph::TimeHarmonicLinearElasticityTractionElement< ELEMENT >::output(), and oomph::HermiteBeamElement::output(). How many items of Data does the shape of the object depend on? This is implemented as a broken virtual function. You must overload this for GeomObjects that contain geometric Data, i.e. GeomObjects whose shape depends on Data that may contain unknowns in the overall Problem. Reimplemented in oomph::SolidFiniteElement, oomph::FiniteElement, oomph::EllipticalTube, oomph::Circle, oomph::RefineableSolidElement, oomph::Ellipse, oomph::StraightLine, oomph::FSIAxisymFoepplvonKarmanElement< NNODE_1D, FLUID_ELEMENT >, oomph::PseudoBucklingRing, oomph::MeshAsGeomObject, oomph::ImmersedRigidBodyElement, oomph::ElementWithMovingNodes, and oomph::FaceElementAsGeomObject< ELEMENT >. Definition at line 208 of file geom_objects.h. Access function to # of Lagrangian coordinates. Definition at line 182 of file geom_objects.h. Referenced by oomph::Multi_domain_functions::aux_setup_multi_domain_interaction(), oomph::MeshAsGeomObject::create_bins_of_objects(), oomph::FSIHermiteBeamElement::dposition_dlagrangian_at_local_coordinate(), oomph::FSIDiagHermiteShellElement::dposition_dlagrangian_at_local_coordinate(), oomph::KirchhoffLoveBeamEquations::fill_in_contribution_to_residuals_beam(), oomph::MeshAsGeomObject::get_bin(), oomph::MeshAsGeomObject::get_bin_vertices(), oomph::KirchhoffLoveShellEquations::get_energy(), oomph::KirchhoffLoveBeamEquations::get_energy(), oomph::MeshAsGeomObject::get_min_and_max_coordinates(), oomph::MeshAsGeomObject::get_neighbouring_bins_helper(), oomph::KirchhoffLoveBeamEquations::get_non_unit_tangent(), oomph::KirchhoffLoveBeamEquations::get_normal(), oomph::MeshAsGeomObject::min_distance(), oomph::AlgebraicFishMesh< ELEMENT >::node_update_in_body(), oomph::AlgebraicFishMesh< ELEMENT >::node_update_in_fin(), oomph::HermiteBeamElement::output(), oomph::MeshAsGeomObject::output_bin_vertices(), oomph::MeshAsGeomObject::output_bins(), oomph::MeshAsGeomObject::position(), oomph::StorableShapeSolidElementBase::pre_compute_d2shape_lagrangian_at_knots(), oomph::StorableShapeSolidElementBase::pre_compute_dshape_lagrangian_at_knots(), and oomph::MeshAsGeomObject::total_nbin(). Definition at line 173 of file geom_objects.h. Parametrised position on object at current time: r(zeta). 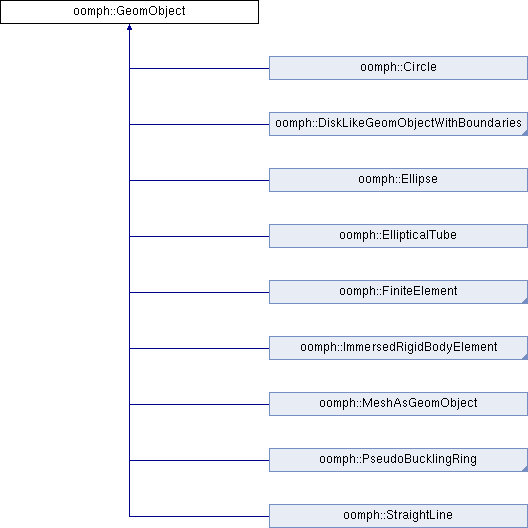 Implemented in oomph::FiniteElement, oomph::EllipticalTube, oomph::Circle, oomph::Ellipse, oomph::ImmersedRigidBodyTriangleMeshPolygon, oomph::FSIAxisymFoepplvonKarmanElement< NNODE_1D, FLUID_ELEMENT >, oomph::StraightLine, oomph::MeshAsGeomObject, oomph::PseudoBucklingRing, oomph::YoungLaplaceEquations, and oomph::ImmersedRigidBodyElement. Referenced by oomph::AlgebraicChannelWithLeafletMesh< ELEMENT >::AlgebraicChannelWithLeafletMesh(), oomph::BrethertonSpineMesh< ELEMENT, INTERFACE_ELEMENT >::BrethertonSpineMesh(), oomph::ChannelWithLeafletDomain::ChannelWithLeafletDomain(), oomph::TriangleMeshCurveSection::connect_final_vertex_to_curviline(), oomph::TriangleMeshCurveSection::connect_initial_vertex_to_curviline(), oomph::UnstructuredTwoDMeshGeometryBase::create_vertex_coordinates_for_polyline_connections(), oomph::UnstructuredTwoDMeshGeometryBase::create_vertex_coordinates_for_polyline_no_connections(), oomph::ImmersedRigidBodyElement::dposition_dt(), dposition_dt(), oomph::ImposeDisplacementByLagrangeMultiplierElement< ELEMENT >::fill_in_generic_contribution_to_residuals_displ_lagr_multiplier(), oomph::BrethertonSpineMesh< ELEMENT, INTERFACE_ELEMENT >::find_distance_to_free_surface(), oomph::ChannelWithLeafletDomain::macro_bound_I_E(), oomph::ChannelWithLeafletDomain::macro_bound_I_W(), oomph::ChannelWithLeafletDomain::macro_bound_II_E(), oomph::ChannelWithLeafletDomain::macro_bound_II_W(), oomph::CylinderWithFlagDomain::macro_element_boundary(), oomph::FullCircleDomain::macro_element_boundary(), oomph::TubeDomain::macro_element_boundary(), oomph::RectangleWithHoleDomain::macro_element_boundary(), oomph::AlgebraicRefineableQuarterTubeMesh< ELEMENT >::node_update_central_region(), oomph::AlgebraicFishMesh< ELEMENT >::node_update_in_body(), oomph::AlgebraicRefineableQuarterCircleSectorMesh< ELEMENT >::node_update_in_central_box(), oomph::AlgebraicFishMesh< ELEMENT >::node_update_in_fin(), oomph::AlgebraicRefineableQuarterCircleSectorMesh< ELEMENT >::node_update_in_lower_right_box(), oomph::AlgebraicRefineableQuarterCircleSectorMesh< ELEMENT >::node_update_in_upper_left_box(), oomph::AlgebraicCylinderWithFlagMesh< ELEMENT >::node_update_IX(), oomph::AlgebraicRefineableQuarterTubeMesh< ELEMENT >::node_update_lower_right_region(), oomph::AlgebraicRefineableQuarterTubeMesh< ELEMENT >::node_update_upper_left_region(), oomph::AlgebraicCylinderWithFlagMesh< ELEMENT >::node_update_VIII(), oomph::ImposeDisplacementByLagrangeMultiplierElement< ELEMENT >::output(), oomph::ImmersedRigidBodyElement::position(), position(), oomph::MeshAsGeomObject::position(), oomph::QuarterPipeDomain::r_B(), oomph::QuarterTubeDomain::r_bot_right_B(), oomph::QuarterTubeDomain::r_bot_right_D(), oomph::QuarterCircleSectorDomain::r_bot_right_E(), oomph::QuarterTubeDomain::r_bot_right_F(), oomph::QuarterTubeDomain::r_bot_right_R(), oomph::QuarterCircleSectorDomain::r_bot_right_S(), oomph::QuarterTubeDomain::r_bot_right_U(), oomph::QuarterCircleSectorDomain::r_bot_right_W(), oomph::QuarterTubeDomain::r_centr_B(), oomph::QuarterTubeDomain::r_centr_D(), oomph::QuarterTubeDomain::r_centr_F(), oomph::QuarterTubeDomain::r_centr_L(), oomph::QuarterTubeDomain::r_centr_R(), oomph::QuarterCircleSectorDomain::r_centr_S(), oomph::QuarterTubeDomain::r_centr_U(), oomph::QuarterCircleSectorDomain::r_centr_W(), oomph::QuarterPipeDomain::r_D(), oomph::CollapsibleChannelDomain::r_E_collapsible(), oomph::QuarterPipeDomain::r_F(), oomph::QuarterPipeDomain::r_L(), oomph::CollapsibleChannelDomain::r_N_collapsible(), oomph::QuarterPipeDomain::r_R(), oomph::CollapsibleChannelDomain::r_S_collapsible(), oomph::QuarterTubeDomain::r_top_left_B(), oomph::QuarterCircleSectorDomain::r_top_left_E(), oomph::QuarterTubeDomain::r_top_left_F(), oomph::QuarterTubeDomain::r_top_left_L(), oomph::QuarterCircleSectorDomain::r_top_left_N(), oomph::QuarterCircleSectorDomain::r_top_left_S(), oomph::QuarterTubeDomain::r_top_left_U(), oomph::QuarterCircleSectorDomain::r_top_left_W(), oomph::QuarterPipeDomain::r_U(), oomph::FishDomain::r_upper_body_E(), oomph::FishDomain::r_upper_body_N(), oomph::FishDomain::r_upper_body_S(), oomph::FishDomain::r_upper_body_W(), oomph::FishDomain::r_upper_fin_N(), oomph::FishDomain::r_upper_fin_S(), oomph::FishDomain::r_upper_fin_W(), oomph::CollapsibleChannelDomain::r_W_collapsible(), oomph::RefineableImposeDisplacementByLagrangeMultiplierElement< ELEMENT >::refineable_fill_in_generic_contribution_to_residuals_displ_lagr_multiplier(), oomph::BrethertonSpineMesh< ELEMENT, INTERFACE_ELEMENT >::reposition_spines(), oomph::AlgebraicFSIDrivenCavityMesh< ELEMENT >::setup_algebraic_node_update(), oomph::AlgebraicCollapsibleChannelMesh< ELEMENT >::setup_algebraic_node_update(), oomph::AlgebraicRefineableQuarterCircleSectorMesh< ELEMENT >::setup_algebraic_node_update(), oomph::UnstructuredTwoDMeshGeometryBase::setup_boundary_coordinates(), oomph::ChannelWithLeafletDomain::slanted_bound_up(), oomph::UnstructuredTwoDMeshGeometryBase::snap_nodes_onto_geometric_objects(), oomph::TetgenMesh< ELEMENT >::snap_to_quadratic_surface(), oomph::ChannelSpineMesh< ELEMENT >::spine_node_update(), oomph::BrethertonSpineMesh< ELEMENT, INTERFACE_ELEMENT >::spine_node_update_channel(), oomph::BrethertonSpineMesh< ELEMENT, INTERFACE_ELEMENT >::spine_node_update_film_lower(), oomph::BrethertonSpineMesh< ELEMENT, INTERFACE_ELEMENT >::spine_node_update_film_upper(), oomph::BrethertonSpineMesh< ELEMENT, INTERFACE_ELEMENT >::spine_node_update_horizontal_transition_lower(), oomph::BrethertonSpineMesh< ELEMENT, INTERFACE_ELEMENT >::spine_node_update_horizontal_transition_upper(), oomph::BrethertonSpineMesh< ELEMENT, INTERFACE_ELEMENT >::spine_node_update_vertical_transition_lower(), oomph::BrethertonSpineMesh< ELEMENT, INTERFACE_ELEMENT >::spine_node_update_vertical_transition_upper(), and oomph::ImposeDisplacementByLagrangeMultiplierElement< ELEMENT >::square_of_l2_norm_of_error(). Parametrised position on object: r(zeta). Evaluated at previous timestep. t=0: current time; t>0: previous timestep. Works for t=0 but needs to be overloaded if genuine time-dependence is required. Reimplemented in oomph::FiniteElement, oomph::EllipticalTube, oomph::Circle, oomph::Ellipse, oomph::ImmersedRigidBodyTriangleMeshPolygon, oomph::FSIAxisymFoepplvonKarmanElement< NNODE_1D, FLUID_ELEMENT >, oomph::StraightLine, oomph::MeshAsGeomObject, oomph::PseudoBucklingRing, and oomph::ImmersedRigidBodyElement. Definition at line 255 of file geom_objects.h. Set # of Lagrangian and Eulerian coordinates. Definition at line 188 of file geom_objects.h. Referenced by oomph::FaceElementAsGeomObject< ELEMENT >::FaceElementAsGeomObject(), and oomph::FSIWallElement::setup_fsi_wall_element(). Access function for pointer to time stepper: Null if object is not time-dependent. Definition at line 197 of file geom_objects.h. Referenced by oomph::PeriodicOrbitAssemblyHandler< NNODE_1D >::adapt_temporal_mesh(), oomph::SurfactantTransportInterfaceElement::add_additional_residual_contributions_interface(), oomph::Circle::Circle(), oomph::ElementWithSpecificMovingNodes< ELEMENT, MacroElementNodeUpdateNode >::construct_boundary_node(), oomph::FiniteElement::construct_boundary_node(), oomph::SolidFiniteElement::construct_boundary_node(), oomph::PoroelasticityEquations< 2 >::d2u_dt2(), oomph::AxisymmetricPoroelasticityEquations::d2u_dt2(), oomph::AxisymmetricLinearElasticityEquationsBase::d2u_dt2_axisymmetric_linear_elasticity(), oomph::LinearWaveEquations< DIM >::d2u_dt2_lin_wave(), oomph::LinearElasticityEquationsBase< DIM >::d2u_dt2_linear_elasticity(), oomph::AdvectionDiffusionReactionEquations< NREAGENT, DIM >::dc_dt_adv_diff_react(), oomph::SurfactantTransportInterfaceElement::dcdt_surface(), oomph::FSIAxisymFoepplvonKarmanElement< NNODE_1D, FLUID_ELEMENT >::dposition_dt(), oomph::PoroelasticityEquations< 2 >::dq_edge_dt(), oomph::AxisymmetricPoroelasticityEquations::dq_edge_dt(), oomph::PoroelasticityEquations< 2 >::dq_internal_dt(), oomph::AxisymmetricPoroelasticityEquations::dq_internal_dt(), oomph::PoroelasticityEquations< 2 >::du_dt(), oomph::AxisymmetricPoroelasticityEquations::du_dt(), oomph::AdvectionDiffusionEquations< DIM >::du_dt_adv_diff(), oomph::AxisymAdvectionDiffusionEquations::du_dt_axi_adv_diff(), oomph::AxisymmetricNavierStokesEquations::du_dt_axi_nst(), oomph::GeneralisedNewtonianAxisymmetricNavierStokesEquations::du_dt_axi_nst(), oomph::AxisymmetricLinearElasticityEquationsBase::du_dt_axisymmetric_linear_elasticity(), oomph::GeneralisedAdvectionDiffusionEquations< DIM >::du_dt_cons_adv_diff(), oomph::LinearWaveEquations< DIM >::du_dt_lin_wave(), oomph::LinearisedAxisymmetricNavierStokesEquations::du_dt_linearised_axi_nst(), oomph::GeneralisedNewtonianNavierStokesEquations< DIM >::du_dt_nst(), oomph::NavierStokesEquations< DIM >::du_dt_nst(), oomph::PolarNavierStokesEquations::du_dt_pnst(), oomph::SphericalAdvectionDiffusionEquations::du_dt_spherical_adv_diff(), oomph::SphericalNavierStokesEquations::du_dt_spherical_nst(), oomph::UnsteadyHeatEquations< DIM >::du_dt_ust_heat(), oomph::WomersleyEquations< DIM >::du_dt_womersley(), oomph::GeneralisedNewtonianAxisymmetricNavierStokesEquations::extrapolated_strain_rate(), oomph::AxisymmetricLinearElasticityEquations::fill_in_generic_contribution_to_residuals_axisymmetric_linear_elasticity(), oomph::AxisymmetricPoroelasticityEquations::fill_in_generic_residual_contribution(), oomph::RefineablePolarTaylorHoodElement::get_interpolated_values(), oomph::RefineablePolarCrouzeixRaviartElement::get_interpolated_values(), oomph::FiniteElement::get_x(), oomph::ImmersedRigidBodyElement::output_centre_of_gravity(), oomph::PeriodicOrbitAssemblyHandler< NNODE_1D >::PeriodicOrbitAssemblyHandler(), oomph::StraightLine::position(), oomph::Ellipse::position(), oomph::Circle::position(), oomph::SolidICProblem::set_newmark_initial_condition_consistently(), oomph::SolidICProblem::set_newmark_initial_condition_directly(), oomph::SolidICProblem::set_static_initial_condition(), and oomph::PeriodicOrbitEquations::set_timestepper_weights(). Access function for pointer to time stepper: Null if object is not time-dependent. Const version. Definition at line 201 of file geom_objects.h. Definition at line 407 of file geom_objects.h. Referenced by oomph::PseudoBucklingRing::accel(), oomph::PseudoBucklingRing::position(), time_stepper_pt(), and oomph::PseudoBucklingRing::veloc(). Definition at line 403 of file geom_objects.h. Referenced by oomph::PseudoBucklingRing::accel(), ndim(), oomph::PseudoBucklingRing::position(), set_nlagrangian_and_ndim(), and oomph::PseudoBucklingRing::veloc(). Number of Lagrangian (intrinsic) coordinates. Definition at line 400 of file geom_objects.h. Referenced by nlagrangian(), and set_nlagrangian_and_ndim().